Club pool table hire can add an extra form of entertainment to your bar area, or even use a side room to create a dedicated pool room for use by patrons. There are a few factors to keep in mind though – here are five of the first things to think about when arranging club pool table hire for your premises. Playing area size is important – you should have at least four feet clearance on all sides of your pool table, plus the size of the table itself. 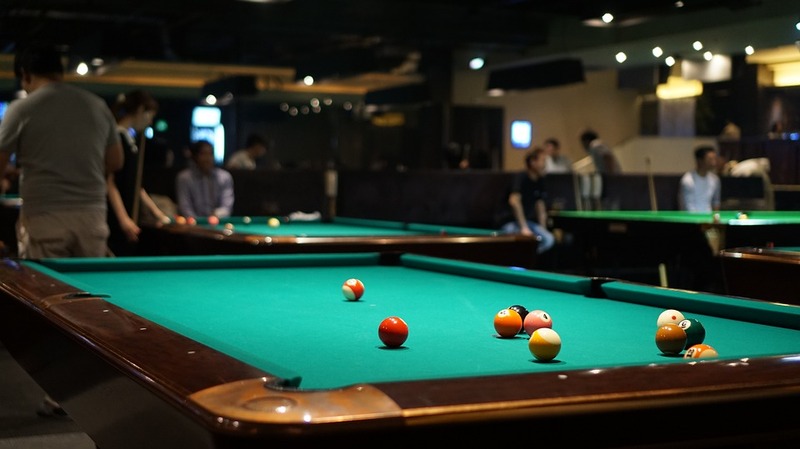 Depending on if you choose a 6-foot pool table or a 7-foot one, this can affect both the length and the width of the playing area size, so if you’re not sure, feel free to ask us before you make your final decision. We supply Supreme pool tables with a choice of Winner and Prince models. Supreme Prince pool tables are very slightly bigger, so again this affects playing area, although only by a few centimetres extra. Supreme Winner pool tables are slightly lighter – by up to 25kg for a 7-foot model – but we can help with the delivery and installation in either case. We offer freeplay pool table rental but if you want your club pool table hire to bring in direct revenue rather than ‘just’ the indirect income of keeping guests in your bar for longer, we have mechanical and electronic coin-op pool tables. Electronic pool tables can be configured to offer a freeplay ‘happy hour’ to bring in more patrons at certain times of day, many of whom will go on to deposit money once the freeplay time is over. Choose a club pool table that suits your premises – whether that’s traditional wood with green baize, or something more contemporary. We can supply hired club pool tables with finishes like aluminium and black pearl, plus wool cloths in a rainbow of different colours – again just ask if you have something specific in mind. If you’re interested in joining a local club pool league, contact the league organisers first and find out if they require a specific size of pool table. You might find some leagues specify a 7-foot pool table, so make sure you find the space for this if you want to be able to hold league matches at your club and bring in more patrons and punters from the surrounding area.